The World Para Athletics Grand Prix in Nottwil was brought to a thrilling conclusion on Sunday with Richard Chiassaro (coach: Jenni Banks) setting a European record in the T54 400m and Hannah Cockroft (Banks) just narrowly missing her own world record in the T34 400m. The fast and furious nature of the 400m led to a fantastic day of action, but it was Chiassaro’s superb quarter mile performance that stood out in particular from a British perspective in Switzerland. After talking about his chances of setting a time within the low 45s on Friday, he duly delivered, clocking 45.26 to win overall. After taking 0.72 seconds off his previous best, the Harlow athlete said: “It’s a massive personal best for me, so I am very happy with that. “We’ve been working on getting off the line quicker with the hard gloves. My top speed is very good as well and I’m holding it for longer as well. The hard work has paid off. Also completing an impressive series of races over the three days, Nathan Maguire (Ste Hoskins) took over a second off his previous best, revising it from 47.96 to 46.39. The astonishing improvement adds to his personal bests over 100m and 200m over the weekend. Hannah Cockroft was close to lowering her own world record over 400m, but just missed out by 0.16 seconds with a time of 57.89 to take the win. It was another near miss for Cockroft who is has two more events out in Switzerland to continue to attack her lifetime bests, but it showed yet more consistency. She said: “It felt really fast today. I had good top speed and I didn’t tire at the end so all positives really. Ben Rowlings (Ian Mirfin) took some notable scalps on his way to second place overall in the men’s T34 400m races. His time of 53.81 saw him beat the reigning European champion, Finland’s Henry Manni, which will give him huge confidence with the WPA European Championships taking place in Berlin this August. There was another personal best for Eden Rainbow-Cooper (Jenny Archer) in the T54 800m. The Weir Archer Academy athlete posted 1:02.42, over a second quicker than her previous best which came in 2016. Elsewhere, Yasmin Somers (Richard Chiassaro) won the women’s T33 400m in 1:33.54 while Mo Jomni (Archer) was sixth in the men’s T53 400m with a season’s best of 51.33. 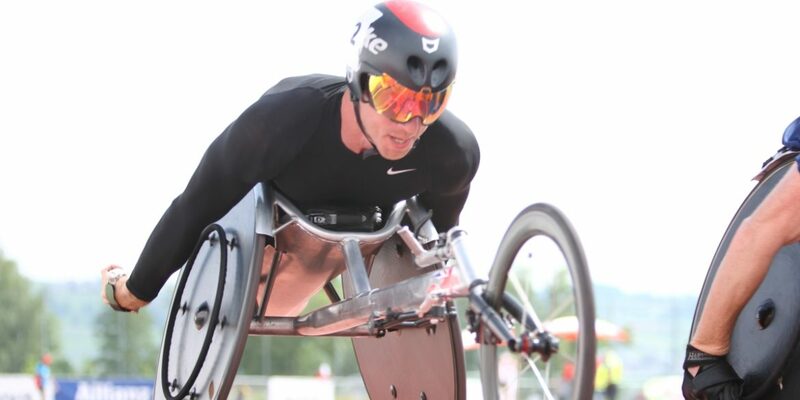 Earlier in the day, JohnBoy Smith (Archer) was the highest placed British finisher in the men’s T53/54 5000m races. His time of 10:58.22 put him in 17th place overall.